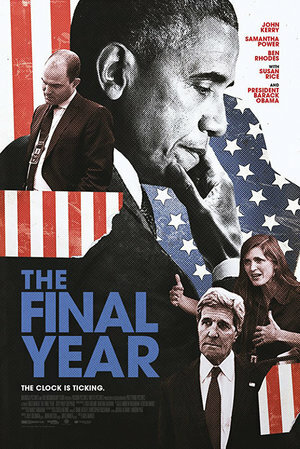 Greg Barker's new documentary The Final Year — which briskly charts the Obama Administration's final six months of diplomatic engagements in 21 countries — is a sharp departure from the rash of embittered political documentaries and scandalous news cycles currently dominating Pennsylvania Avenue. At once wistful and undoubtedly prescient, The Final Year is not only a paean to a President who eschewed combustible rhetoric and rash militaristic alternatives, but an emotional plea to consider the same diplomatic approach beyond his eight -year term. There are noteworthy objections to such a generally uncritical approach. Set to Philip Sheppard's rousing orchestral score, The Final Year's admiring focus on key members of the Obama team — primarily U.S. Ambassador to the U.N. Samantha Power, Deputy National Security Advisor for Strategic Communications Ben Rhodes, and Secretary of State John Kerry — is far too often a glossy homage with a The West Wing flavor, which doesn't readily blend in with today's increasingly grave political climates across the globe. Through staged office interviews with Rhodes, Barker provides a one-sided interpretation of Obama's foreign policy accomplishments. Rhodes provides well rehearsed explanations about the Paris Climate Change Accord, the Iran Nuclear Deal, and the lifting of the United States' trade embargo against Cuba; each are readily treated as inherently good pacts for the world's interests. However, Barker does not provide any follow-up questions on the Obama Doctrine's enforceability, nor does he present other Obama team members or politicians who may have a different viewpoint as to the wisdom of the Iran Deal, which has been viewed as a controversial decision across the political spectrum. For that matter, although Obama is firmly against Groupthink, not once does The Final Year present a scene where one of the film's key players engage in a heated debate with the other — a peculiar omission given several reportedly heated internal debates within the Obama Administration on the extent of US military intervention in Syria. Barker's treatment of Kerry's foreign policy work constitutes a visually captivating though ultimately unrevealing highlight reel of diplomatic multi-tasking. Barker spices up Kerry's coverage with quick clips of his travels north of the arctic-circle to witness ice caps melting, and to Vietnam in a continued effort toward US post-war reconciliation efforts. The scenes, accompanied by Kerry's earnest voiceover, are mildly effective as a melancholic goodbye to a secretary of state who conveyed to the world that the United States is capable of self-effacement for its past military engagements, and has concern for third world countries affected by climate change. However, Kerry's footage is so swift, that those craving the same kind of observation afforded to former Secretary of State Robert McNamara in the excellent The Fog of War will likely feel a bit more disappointed than nostalgic. The Final Year is by far more enriching when, as is the case in its excellent second half, it sheds its romantic veneer and allows for some conflict to breathe life into the film. Barker's coverage of Samantha Power is a case in point. A lively camera follows Power on her 2016 tour of Nigeria, where she solemnly communicates with families whose girls were abducted in Boko Haram. In another poignant scene, Power and Rhodes acknowledge that they have differences as to how much focus Obama's final U.N. address should place on 2016's epic humanitarian and refugee crises. Barker acknowledges that the Obama Administration did not entirely resolve complex world issues of genocide, and the continued lack of humane treatment of refugees. However, The Final Year remains justifiably reverential to an Administration which, even during its final months, worked to carefully address diplomatic alternatives toward a safer, more peaceful world. Interestingly, The Final Year pays little attention to Donald Trump's 2016 Election Campaign until the final act, when Obama's staff conveys visible disappointment at Trump's surprising US presidential win. But perhaps this lack of attention to Trump is The Final Year's cumulative argument. As Rhodes opines during a meeting with foreign officials, diplomacy (and avoiding senseless war and baseless media exchanges) is tedious, sophisticated work. To strive for this goal, the Obama team simply didn't have the time to engage in low-level rhetoric against a nationalist demagogue who thrives on coarse dialect and rash decision-making. Some may argue that given 2016's political realities, Obama should have been more involved in campaigning against Trump's presidential run. But as The Final Year quietly argues, if the US electorate fails to elevate itself to a higher level of political vernacular than coarse tweets and reality TV-style colloquies, then 2016 may be the best year the United States will have had for a long time to come.